I love learning about natural remedies and prevention methods for pets. 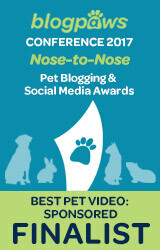 It seems like ever since I started blogging, I have learned so many great tips in all natural care for pets. I think I can attribute that to my working with veterinarians for several years. A handful of them were into some natural treatments, but not all. 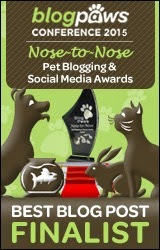 Recently, I was asked to review an e-book called All Natural and Homemade Dog Care by Martin Arias. Martin has worked with dogs in a shelter setting for several years. This book is not something that I would probably just sit down and read all the way through. Instead, I would use it as a resource and refer to it when I need to. "Perhaps one the most important lessons learned is to keep things simple. Humans are great at taking a simple problem and complicating the heck out of it. 1. Improve the health of your dog and your family. I sure do like all of those reasons! The book is a short guide that contains several helpful how-to's for things like homemade dog shampoos, dental treat recipes, mosquito repellent, a pet stain removal formula for your carpet, and flea control just to name a few. I am particularly interested in trying out the homemade dog toothpaste since we picked up a new toothbrush at the Austin Pet Expo. Another recipe I want to try from Arias' book is the homemade ant killer. Sorry ants but you've got to go. You're driving me crazy! These remedies are so simple, why didn't I think of them? Plus, when you purchase All Natural Homemade Dog Care you also get Arias' 27 Homemade Dog Treat Recipes for free. You can find recipes like "Bulldog Banana Bites" and "Massive Mastiff Munchy Muffins". If you're like me and aren't too creative with the dog treat recipes, I think you could get a lot of great ideas from this book. I notice a lot of the recipes in the recipe book do contain grains and/or corn ingredients, so some of you may want to substitute those ingredients if your dog has allergies. All Natural and Homemade Dog Care by Martin Arias is available for a price of $7.99. Don't forget, that includes the 27 Homemade Dog Treat Recipes too. You can purchase the book here. And you can follow Dog Days on Facebook for more updates. 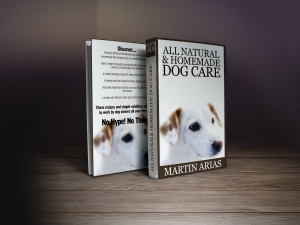 Martin Arias has been gracious enough to offer 3 Pawsitively Pets readers a copy of his e-book - All Natural and Homemade Dog Care. 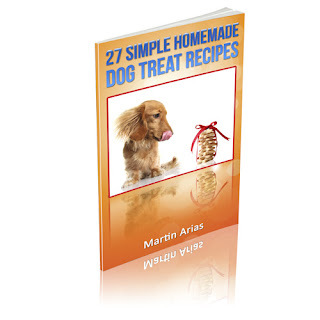 (Don't forget that the book also comes with the recipe book - 27 Homemade Dog Treat Recipes.) Because the prize for this giveaway is digital, I'm happy to tell you that all of our friends from around the world are welcome to join! The giveaway starts now, and will end on August 25th at midnight CST. Disclosure: I received a free copy of this book from the author for an honest review. I received no other form of compensation. All thoughts expressed here are my own. Giveaway winners will be selected randomly and contacted via email. Winners have 48 hours to respond. A new winner will be selected if there is no response within the given time frame. Pawsitively Pets is not responsible for shipment of prize. Oooo, I like natural remedies (and don't forget those treats) too! :-) Hm, an ant repellent...that would be nice! We currently use the whole vinegar and water spray thing, which is good...but isn't long lasting! Might have to check out this ebook (after entering your giveaway!) Hehehe! Hey I've been using an actual ant poison spray right now, and that stuff doesn't last long at all... maybe I should just go with the vinegar thing like you're doing! We recently read about homemade toothpaste and were surprised how easy it was. Great idea for a book and yes keep it simply. Have a tremendous Thursday. Yea it definitely is very easy! Great review! Sounds really interesting. I'm with you on those ants... hate 'em and they invade every darn spring! Yea... mostly every year I get sugar ants. This year they came in briefly and that was it. Now for the past few weeks I've had fire ants... grrr! So glad you guys get to join. I'm gonna have to have a pawty soon for everyone. This sounds really interesting. I'm always interested in "natural" solutions. We are all about the natural solutions in our house. This sounds like a great book! That sounds like an interesting book. When I was a kid, my mom was always using natural things to clean something or treat something. She just used basic house hold things. Simple, natural ingredients. Sometime in my lifetime, all of that went by the wayside. It is nice to see books popping up with these suggestions again. I will look and see Sugar - you can also just click the little G+ heart in my sidebar. Thanks and good luck! That does sound like a good book but I would rather have a hard copy so don't enter us in this. Great review. Oh I bet you are Remy! Like Molly, we just did the homemade toothpaste thing too. I'd love to go natural with the flea stuff... as long as it really works! Afraid to make the leap. I'm super allergic to their bites, and they are really bad here in So Cal since it never gets cold enough to kill them. Would love to see what the book has to say on that. Yea I'm still skeptical with any natural flea stuff. It doesn't really get cold here. I've heard of dogs being super allergic but didn't think about humans too. 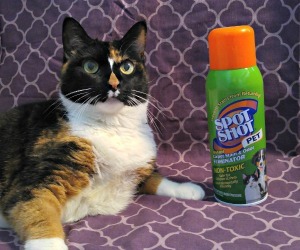 I got something that would be good for you to spray on your legs. I would love this book. I am always on the hunt for natural stuff. Great review! Definitely an interesting read. I try to use as many natural products as I can and I'm always on the look out for more ideas. Thanks for sharing this! I'm always looking for books that offer ways to take better care of our dogs and cats. Thanks for sharing. Definitely going to check out that first one. It covers a topic that I see raised daily in a couple of dog groups I'm in. This book sounds great. I love to try all natural remedies and recipes.